After a glorious day, the sun has set in an almost cloudless sky. 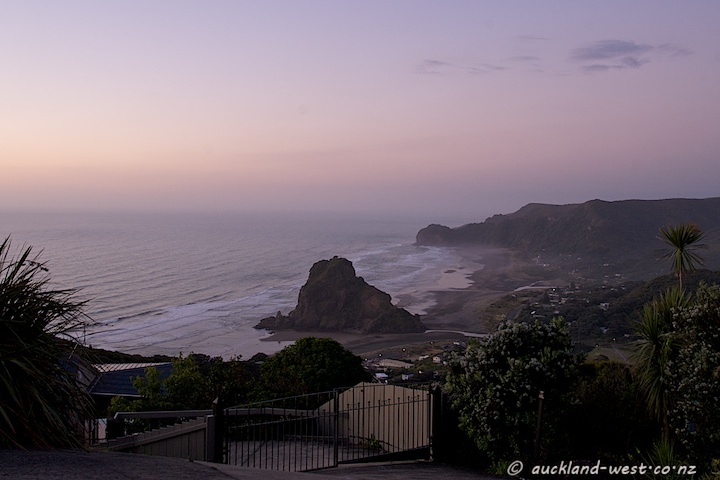 See a daytime view of Piha from this spot. Wow!Stunning!What a view!I wish I could be there too! I really like the mist in the distance. The pastel shades in the sky are soothing. love these soft shades of purple…beautiful sky! That is one of the most breathtaking, gorgeous places/photos I’ve ever seen! It really mesmerized me for a few minutes and I couldn’t look away! I can only imagine how fantastic it was to actually be there — for real!! Thanks for sharing, Paul! Have a great weekend! I love the mood at the start and end of the day by the sea. We’re going to the beach for a holiday soon. Wow, what a marvellous shot!